Sportswear giant Adidas is facing complaints over a new trainer that some say features a racist cartoon image. The offending footwear includes a yellow picture of an Asian youth with bowl-cut hair, pig nose and buck teeth. 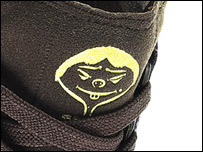 Asian-American groups have complained that the picture on the shoe's tongue portrays an anti-Asian stereotype. Adidas said it had intended no offence. The image was designed by US graffiti artist Barry McGee who has previously used it in an anti-racist commentary. The overall trainer was designed for German-based Adidas by US clothing firm Huf. An Adidas spokeswoman told the San Jose Mercury News that the company "appreciates all self-expression" and "had no intention of offending any individual or group". Produced in a limited run of 1,000 pairs, the Adidas "Yellow Series Y1 Huf" shoe retails at $250 (£143). "It's very sad and disturbing that in this day and age, this stereotype is coming from a large and global company like Adidas," said Vincent Pan, executive director of Chinese for Affirmative Action in San Francisco. The trainer has also been criticised in internet discussion rooms. Huf owner Keith Hufnagel dismissed the accusations of racism as "internet garbage". "They should do their studying before they say anything," he added, referring to the image's previous anti-racist use. Yet Aimee Baldillo of the Asian American Justice Centre argued that "slapping a Chinese face on a sneaker removes it from that context". She added that the centre had received a number of complaints.